Added on December 30, 2009 by PS Cat02. 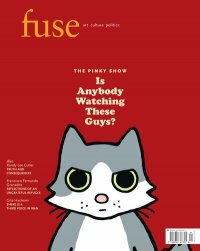 FUSE MAGAZINE IS PLEASED TO ANNOUNCE THE LAUNCH OF OUR WINTER ISSUE! The winter issue features a conversation between Winnipeg-based artist and curator Milena Placentile and The Pinky Show, Vancouver’s Randy Lee Cutler writing about Truth and Reconciliation, Gita Hashemi on the Women’s movement in Iran and Francisco Fernando Granados’ column Reflections of an Ungrateful Refugee. Also in this issue, an Olympic Index by Am Johal and a call to action from No One is Illegal Vancouver. Artist projects by Mel Chin and Kevin Rodgers and reviews of the 2nd Annual Palestine film festival, Omar Fast’s Nostalgia, Roger Hallas’ Reframing Bodies, ATSA’s Change exhibition and the experimental shorts program from ImagineNative 2009. Toronto Free Gallery and Fuse magazine are pleased to present The Pinky Show’s latest multi-media installation, Class Treason Stories (excerpts) organized by Milena Placentile. OPENING RECEPTION: Thursday, January 14 at 8pm. Opening reception is in conjunction with Fuse magazine’s winter edition launch. See below for more details. ARTIST TALK: Please join and the human representatives of the Pinky Show for an artist talk. January, 16 at 4pm. From an undisclosed desert location, somewhere between Los Angeles and Las Vegas, a collective of gently voiced cats produce and disseminate an educational project called The Pinky Show, intended to cultivate intellectual curiosity, openness, and compassion. Focusing on information and perspectives that have been misrepresented, suppressed, ignored, or otherwise excluded from mainstream discussion, Pinky and her friends use a variety of formats (i.e. online videos, visual art, books and 'zines, blogging, etc.) to explore the unseen world in ways that are easy to understand, with special attention given to reconnecting information (plentiful in our contemporary world) to its oft-ignored ethical and moral dimensions. The Pinky Show's video episodes are generally organized around "simple" questions: What is settler colonialism? Is the War in Iraq legal or illegal? How do we get rid of nuclear weapons? They consider the mainstreaming of progressive ideals to be a foundational component to any broad strategy to create a more aware citizenry - one that is more apt to understand, support, and participate in the vital work being done by the many thousands of social change organizations established throughout the world. In addition to material production, they also deploy human representatives to carry out their educational objectives via diverse forms of community programming including workshops and other public presentations, exhibitions, and agitprop dissemination. Some examples include Picturing Politics: Artists Speak Truth to Power (Arlington Arts Center, Arlington, Virginia), Encounter on Radical Education (Ljubljana, Slovenia), and study circles and workshops with the Center for Hegemony Studies (Honolulu, Hawaii). Class Treason Stories (excerpts) seeks to provoke questions about the nature of education and the application of knowledge for either socially beneficent or individualist and competitive purposes. It inquires about the transformations we could each undertake in order to move toward a genuinely ethical state of being. A well-established internet phenomenon with fans worldwide, this exhibition marks The Pinky Show’s first visit to Canada organized by Milena Placentile. After launching at Gallery 1C03 in Winnipeg, Manitoba, Class Treason Stories (excerpts) will join us in Toronto before moving on to Sherbrooke, Quebec. For press inquiries and photos please contact: Izida Zorde at izida@fusemagazine.org. Toronto Free Gallery is a non-profit art space dedicated to supporting work that deals with social justice, cultural, sustainability and environmental issues. We our proud to receive support from the Ontario Arts Council, Canada Council for the Arts and Trillium Foundation.